The year 1829 marked the beginning of a new era. The need of a church had long been fell and at this time steps were taken towards the building of the mother church of Cornwall. St. Columban's first church was modestly small and ran east-west parallel to Fourth Street. The first resident priest was Father James Bennett, who took up his residency in 1834. In August Of 1864 the cornerstone for the second church was laid by Bishop E. J. Horan. The first church had to be replaced because it had blown down during a fierce Gale. In 1894 ground was broken for the construction of the third and present church. It was first felt that the second church could be expanded but then it was decided to go ahead with the building of a larger church to accommodate the growing congregation. The church was completed in 1896 a[ a cost of $47,500 and still looks after the needs of about 2,000 families. Some confusion, however exists over which St. Columban is our patron since there are, in fact, two saints bearing this name. St. Columban was considered to be the Evangelist of the Highlands and since the first bishop was from Inverness, it can be presumed that it is St. Columban of Iona who IS Our patron. The name of Iona given to the bishop's residence in St. Raphael"s and the name of St. Finnan given to the Cathedral in Alexandria lends credence to the fact that it is St. Columban of Iona that we honour. Columban was in his forty - fourth year when he departed from Ireland with twelve companions, and landed at Iona on the eve of Pentecost, May 12, 563. They built the Iona foundation consisting of church, refectory and cells and after spending about two years it the monastery began their mission to convert the "Picts". Columban preached to [the King of Inverness and through his wisdom was able to convert not only the King but his entire court. the the inhabitants of the glens and wooded areas of Northern Scotland. The monastery of Iona became well known throughout Scotland and Ireland and attracted scholars from all over Europe. The preaching of Columban coupled with numerous miracles soon gained him the reputation riot only of a scholar, but also of a Saint By the time of his death, June 9, 507, his influence could he felt by numerous monastic foundations in Scotland, Ireland and continental Europe. He truly was a saint for all Celts. St. Columban's has had two bells during its many years. 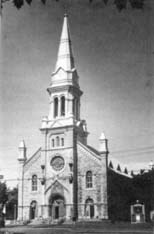 The bell for the first church was blessed by Father George A. Hay of St. Andrew's, on March 24, 1844. It was named Mary Christine after its acting godmother Mary Christine MacDonald wife of John Sandfield MacDonald, first premier of Ontario. This bell can now be seen on the front lawn of the church. The bell In Our present church was christened August 31, 1902, by Bishop Alexander Macdonell, first Bishop of Alexandria. The bell was cast in Belgium and weighs approximately 4900 lbs. With the wheel and other attachments the bell weighs over 6000 lbs. Catholic education was introduced into our community around 1842 under the pastorate of Father Aeneas McDonald. The first Separate School in Cornwall was located in a house on the corner of Fourth and Augustus Streets in 1872. The first Separate School Board followed February of the same year. In 1884 a brick school was built for boys and was known as Centre Ward School. In 1891 it was ex- panded. This building was demolished in 1949 and a new school built. The Girls' and Boys' Schools were re-named St. Columban's West and East respectively in 1959. School on the corner of York and Third Streets opened its doors and for over a decade the pupils of the elementary school were able to advance into High School and pursue their Studies there. It was the first Catholic High School ever to open in Cornwall. For the past 100 years, the neighbours to the west of the rectory, have been the Sisters of the Congregation of Notre Dame. The Sisters arrival in Cornwall was due to Father (later Monsignor) Charles B. Murray who was commissioned by (His Grace) Archbishop James Vincent Cleary of Kingston, to go to Montreal and attempt to acquire the services of the sisters. On January 5, 1885, three sisters; Sr. Mary Frances, Superior, Sr. St. Michael of the Saints and Sr. St. Mary Jane arrived. Thus was the beginning of 100 years of devoted service. The year 1885 marked the beginning of better standards of education in Cornwall. The sisters continual attention and care for the many students were quite influential in gaining the respect of the children and eventually that of the community. Many parishioners have fond memories of their days at St. Columban's Girls' and Boys' Schools, later St. Columban's West and East. The Presentation Brothers arrival in Cornwall was due to the efforts of Monsignor George Corbet. The Brothers arrived from Ireland in the Fall of 1913. Monsignor Corbet had inquired about the availability of the Brothers when difficulties in staffing the Boys' Separate School had reached a crisis. The Brothers struggled at the beginning of their 46 years because of primitive classroom facilities. Eventually though, they adapted and their standards of education were comparable to those that had been set by the Sisters of the Congregation of Notre Dame. With the end of the school year in 1959, the association between the Presentation Brothers and Cornwall came to an end. The loss of the Brothers was unfortunate as they were quite popular among the people but times change and they were given new duties. Their moving was a sad occasion but their memories live and their work carries on. Monsignor George Corbet arrived at St. Columban's in October of 1890 to serve as pastor and remained in this position for 42 years. Monsignor Corbet was the prime mover in replacing old St. Columban's with the present stone edifice in 1896. Monsignor also served as Vicar-General of the diocese from 1890-1928. He was twice called upon to administer the diocese after the death of two former bishops. In 1923, he celebrated the Golden Jubilee Anniversary of his ordination on which occasion he was honoured by being made a Prothonotary Apostolic, carrying with it the title of Right Rev. Monsignor. Monsignor Corbet's accomplishments are endless. A few of these include the establishment of the Hotel Dieu Hospital in 1897, and the establishment of St. Paul's Home for the Aged in 1906 and the Nazareth Orphanage in 1909. He was also instrumental in acquiring the services of the Presentation Brothers in 1913. Monsignor Corbet served as pastor until his death in November, 1932, in his 88th year. He was deeply mourned by citizens of all denominations and from every walk of life. The Calvary Scene to the east of the church marks the earliest cemetery of St. Columban's Parish. The first and second churches were located to the east of the cemetery, where old Corbet Hall stood. The present church was built to the west opposite the rectory which had already been built. Parish records date back to November 1834. The first recorded burial occurred in February, 1835. The stone indicating the earliest (unrecorded) burial was in July of 1831. Some 300 people were buried here and a total of only 47 headstones erected. This burial ground continued to be in use until 1879. Work began on the grounds as early as 1933. The work was started by George Vasbinder, the church sexton at that time, under the observation of Father John M. Foley, pastor at St. Columban's from 1933-1944. At that time only one stone remained standing. By 1936, stones had been collected and formed into a memorial cross. The cross forms the base for the Calvary Group. This Group fulfills the double purpose of beautifying the monument and at the same time preaches a perpetual sermon to all those who pass by, the story of Christ dying on the Cross surrounded by a few faithful friends, Mary, his Mother, Mary Magdalen, and John the beloved apostle. This Calvary was erected in memory of all the dead of the parish. In 1925, Corbet Hall opened to serve as our Parish Hall. Named after Monsignor George Corbet, this hall primarily served as a meeting place for the different societies and groups of St. Columban's. This hall served the community until 1963 and was torn down in the same year. In 1939, Father John M. Foley purchased the old Legion Hall on Pitt Street, which was used until our present hall was built in 1962. Corbet hall, which had served as our Parish hall, was then used mainly for C.W.L. meetings.